The new Fa La La La Felt from Lark Books is now available! The fish is out of the bag! Lark Books has launched their new e-book Fa La La La Felt, and I was lucky enough to have a few projects included. 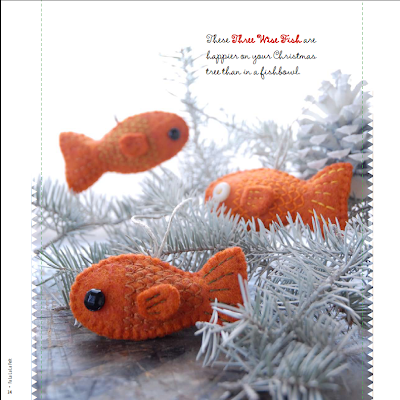 There are 45 super cool felty projects in this book, amongst them you'll find the wee fish you see above. I've seen a few of the other projects and trust me, they're adorable. Go buy your copy now and start making lovely things for the holidays right now! Go! You can buy your e-book here. I hope all of you celebrating today enjoy good company and good food and have a good nap with a full belly. We're celebrating with family today and will be hosting our Thanksgiving dinner on Monday. Drumstick up there has a few days reprieve, but he looked a little sweaty and nervous this morning. I made a pumpkin and cream cheese jelly roll for today's meal and thought I'd share the recipe. It has enough pumpkin flavor to be festive, but not so much that it's overwhelming. I sprinkled on a little powdered sugar and made some marzipan acorns to top it off. 1. Heat oven to 375. Line a 15 1/2 x 10 1/2 x 1 jelly-roll pan with waxed paper and coat with oil/shortening/spray. 2. Combine flour, baking powder, spices, and salt in a small bowl. 3. Beat eggs in a large bowl on medium speed for 2 minutes or until they thicken slightly. Beat in sugar, a tablespoon at a time. Continue beating until very thick and lemon-colored, about 5 to 7 minutes. On lowest speed, beat in pumpkin until blended. With a rubber spatula, foldin flour mixture in 2 batches and spread evenly in pan. 4. Bake 10 to 12 minutes or until the top of the cake springs back when touched lightly in the center. Generously sieve powdered sugar over a clean kitchen towel. When cake is done, loosen edges and invert onto towel. Remove the waxed paper and sprinkle the cake with additional powdered sugar. From a short end, roll up the cake in jelly roll fashion and cool on a wire rack for 1 hour. 5. Prepare filling; beat the cream cheese, sugar, and vanilla in a medium-sized bowl for 5 to 8 minutes or until creamy. Stir in toasted pecans. 6. Unroll cake. Spread with filling. Reroll without the towel. Cover and refrigerate at least 4 hours or overnight. Grab a cup of coffee and enjoy some cake. Today's wordless Wednesday needs a little explanation. See, while the photo isn't much to look at, you should see this in the dark. This morning as hubby was stoking the woodstove in the dark, he pulled a piece of bark off of this log and beneath the surface was a light show, given off by luminescent fungus, sometimes known as foxfire. It was glowing like a little runway down the entire length of the log. So cool! It makes me want to pull the bark off of all the dead trees in our tree pile one night to see how many other have this under their skins. I had hoped to photograph all of the different acorns that felli in our forest this year, but life got busy and I didn't quite finish my goal. I had taken these early in the fall, which is why everything looks so lush and green, and after reading a fun comment from someone who entered last week's giveaway I was reminded that I had a few pics to share. She had said that the European acorn didn't have such a nice head but that they were compensated because their squirrels have tufts on their ears. :D It made me giggle, and made me wish our squirrels had tufts on their ears. I've often wondered how people picture acorns in their heads. After making so many wool acorns, I realize I make acorns in a style that is familiar to me, but that may look disproportionate to others. So how do acorns look to you? Does anyone have acorn pics they'd like to share with me? Here's an earthy little ornament project for you to try. The boys and I had fun making these and wanted to share them with you. Flip your acorn cap upside down and put a generous dollop of glue in it. Let the glue set up for a few minutes until it starts to get a bit tacky. This will help your twig stay upright a little better. When your glue has set up a bit, insert a piece of twig into the acorn cap. Unroll a bit of cotton from your cotton ball and using the toothpick, poke it around the stem into the glue. The boys really liked this part because they thought they were needle-felting. Allow your mushroom to dry, and voila! An adorable little mushroom! If you'd like to make a hanging ornament, drill a hole in the top of cap and thread through a piece of hemp, twine, ribbon, etc. and repeat the same process. I think these will look great tied on a package or hanging in the Christmas tree this year. The boys and I had a little fun hiding some of these in the woods. You can see some of those pics here on my flickr page. So it seems I've been on a fruit kick the past few days. The dear Heather from artbyheather asked me like a year ago (seriously, a year ago), to make her an apple and orange ornament and I just now finished them. I was so excited by the fruit fiesta that I decided to add a pear to the mix. I made a few of each and put the extras in the shop. I just added the pears today, but the apples and oranges have already gone to their forever homes. Isn't that great? It must be a holiday thing, but I'm on an ornament kick so expect to see a few new offerings soonish. (I promise, it won't be a year) I hope you'll stop back and check them out. Occasionally I'm asked if I sell my photographs. I'm not a trained photographer so the question always takes me off guard. I stammer a bit that no, I don't, I'm a trained artist but never taken photography courses, blah blah blah. It's flattering but takes me out of my comfort zone a bit, so after much (trust me, MUCH) inner debate, I've decided to try it out. I've just listed a few photographs in the shop and will be listing more, including some notecards, in the next few weeks. I hope you'll check them out, and I want to thank those of you that have given me the encouragement. It means a lot to me to know that some of you find some beauty in how I see the world. It's been a month since I last checked in on my acorn rainbow. The leaves are off the trees now and my mossy stump is clearly visible against the dying vegetation. The moss is changing color too, offering a shocking lime green against the brown oak leaves. Only three of the original 6 acorns are visible. The other three have either been carried off by curious critters or are hidden beneath the leaf litter. The purple acorn is nestled in a bed of sporophytes. The green one is looking a little fuzzy, but I'm pleasantly surprised how well they've all held up against the elements thus far. We've had a lot of rain and it's snowed twice already....I suppose my hair would be a bit fuzzy by now too. The orange one had been pushed off the stump and I gingerly pulled the leaves back to find it. In a disturbing turn of events, an offering of another type took place near my mossy stump. Just a few feet away I found the remains of our missing hen. She had clearly been supper for a fox, eagle, or owl. She had gone missing about a week ago and after she disappeared the other hens spent the next few days hiding under the coop, which told us that they had seen her abduction. When an eagle had taken our duck, the other chickens hid under my porch for almost a week. Though sad, it's part of the reality of living in the woods. Next month the stump will likely be covered in snow, but I'll check back in to see if I can catch a glimpse of the acorns.